A MiG-29 (9.12) ‘Fulcrum-A’ of the 237th Composite Aviation Regiment, stationed at Kubinka in the Moscow Military District in the early 1990s. This historic unit still serves as the Air Force’s Aviation Equipment Demonstration Centre. Three views of the prototype of the original, abortive MiG-29M armed with advanced weapons including Kh-31 (AS-17 ‘Krypton’) anti-radar missiles and R-77 (AA-12 ‘Adder’) air-to-air missiles. The original MiG-29M launched efforts to create a genuine second-generation ‘Fulcrum’, including flyby-wire flight controls, advanced structure, improved powerplant, avionics and weapons systems. The 9.15 yielded five prototypes. Developed by the USSR in response to increasingly sophisticated Western warplanes, the MiG-29 soon established a formidable reputation as an agile dogfighter. Despite its shortcomings, it has continued to undergo development with efforts to extend its range and the addition of a multi-role capability. Although it entered Soviet Air Force service as a lightweight counterpart to the heavyweight Su-27 fighter, the MiG-29 traces its roots back to a design for a heavy fighter. This was later scaled down to meet a requirement for a ‘frontal’ fighter that would primarily serve in a short-range air defence role, but would also offer a secondary ground-attack capability. Detailed design work began in 1974. In order to keep pace with Western fighter development, the MiG-29 was to make use of a look-down/shoot-down capability and be able to operate in an electronic countermeasures environment. Other important elements of the design were undercarriage and engine intakes optimized for operations on rough and semi-prepared forward airstrips. Employing a blended high-lift, low-drag wing and forward fuselage, the MiG-29 was tailored for high angle-of-attack performance, providing superb low-speed and high-Alpha agility. The first of 11 prototypes completed a maiden flight in October 1977. After eight pre-production machines, the initial production version began to be delivered to the Soviet Air Force’s Frontal Aviation elements in 1983, and was known to Mikoyan as the 9.12 and to NATO as the ‘Fulcrum-A’. In this original form, the primary mission sensors comprised an N019 pulse-Doppler radar and an infra-red search and track system. The pilot was provided with a helmet-mounted cueing system. The similar 9.12A version was delivered to Warsaw Pact countries and other close allies, while the further downgraded 9.12B was produced for export to non-Warsaw Pact operators. A two-seat combat trainer was developed and fielded as the 9.51 MiG-29UB ‘Fulcrum-B’, with radar deleted and a second seat under an elongated canopy. 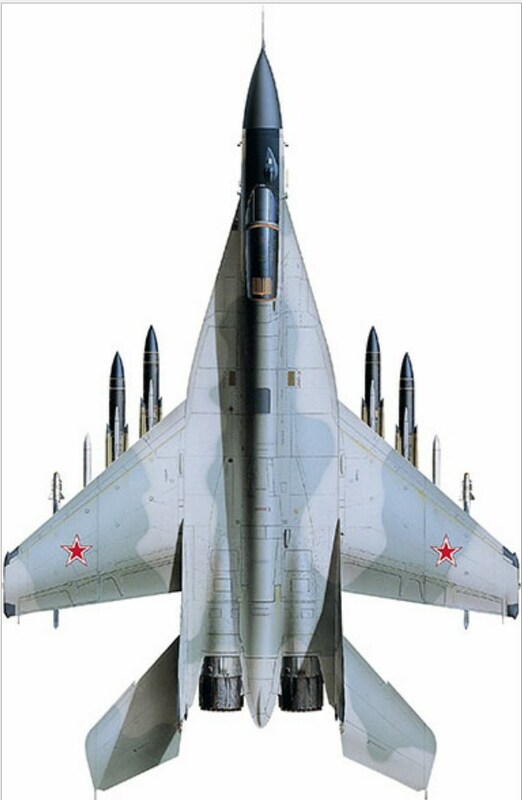 In 1984 Mikoyan flew a first example of the improved 9.13 ‘Fulcrum-C’ that retained the basic MiG-29 nomenclature, but which carried additional fuel and avionics in an enlarged spine. A further improved ‘Fulcrum-C’ was the 9.13S model, the key features of which were a more advanced flight-control system and an improved N019M radar with multi-target tracking/two-target engagement capability and compatibility with advanced R-77 (AA-12 ‘Adder’) air-to-air missiles. Underwing fuel tanks were also now offered as standard. After the Cold War, the 9.13 formed the basis of a family of increasingly advanced MiG-29s aimed at the export market, and with enhanced capabilities that included expanded multi-role flexibility and Western communications systems. The first of these upgrade configurations was the baseline MiG-29SE, with the improvements developed for the Soviet MiG-29S, together with the option of Western-style displays and instruments and Western navigation, identification friend or foe (IFF) and radio equipment. The MiG-29SD includes NATO-compatible IFF and navigation/communications equipment, improved radar, R-77 compatibility and provision for a bolt-on retractable in-flight refuelling probe. The MiG-29SM focuses on enhanced air-to-ground capabilities, and includes a new cockpit display, radar modifications and weapons system improvements allowing the use of TV- and radar-guided bombs and missiles. Most advanced of these upgrades is the MiG-29SMT featuring a ‘glass’ cockpit, enhanced air-to-ground capabilities and a new, even larger dorsal spine to accommodate extra fuel. During the 1980s Mikoyan had ambitious plans for a second-generation MiG-29 that would employ an all-new airframe design. This took the form of the land-based 9.15 MiG-29M and the carrier-based 9.31 MiG-29K. However, post-Cold War funding cuts saw these programmes abandoned in the early 1990s. As the manufacturer’s fortunes improved in the twenty-first century, MiG returned to advanced MiG-29 variants, and brought to market a new, unified family of MiG-29 multi-role fighters derived from the 9.15 and 9.31. The latest variants are based on the navalized MiG-29K and MiG-29KUB (9.41 and 9.47) developed for the Indian Navy. The land-based equivalents are the MiG-29M/M2 variants, and all feature open architecture avionics, Zhuk-ME radar with a slotted planar array, and new RD-33MK engines with full-authority digital engine control (FADEC). Further enhancements are incorporated in the MiG-35 and two-seat MiG-35D, which boast a multi-mode phased-array radar, a new electro-optical targeting and reconnaissance system, an improved IRST sensor and a new defensive aids system. All of the new versions are also offered with thrust-vectoring engines. Side number 712 is the Product 9-67 MiG-35D/UB two-seater prototype/demonstrator. The first batch of six RAC (Russian Aircraft Corporation) “MiG” MiG-35 multi-role combat aircraft will soon be delivered to the VKS (Russian aerospace forces), according to Ilya Tarasenko, director general of RAC MiG, in an announcement made at the production plant at Lukhovitsky on November 28. He also said that an active phased-array radar would be offered as an option and stated that a prototype equipped with such a radar had already been completed. The contract for the production of this initial batch of six MiG-35s was signed during the 2018 Army Forum on August 22. Delivery of these aircraft will allow completion of all planned tests in early 2019, after which serial production will begin at the Sokol Nizhnii Novgorod Aircraft Plant. In 2013, Novosti reported that 37 MiG-35s would be purchased, but 170 aircraft are now planned for the Russian air forces. The MiG-35 is part of what RAC MiG calls a unified family of multi-role fighters, consisting of the carrier-borne MiG-29K/KUB for India and MiG-29KR/KUBR for the Russian Navy, the MiG-29M/M2 for Egypt, and the MiG-35 for the Russian air forces. All use the same basic airframe, with tandem cockpits (the single-seaters have extra fuel in place of the rear cockpit but still employ a two-seat canopy) and a bigger wing compared to the MiG-29, with bigger flaps and horizontal tails. Carrier versions have an arrester hook and folding wingtips, while land-based variants have a braking parachute and no wing-fold. The MiG-35 designation was originally applied to an earlier attempt to produce an advanced version of the MiG-29. Six MiG-29M prototypes were produced between 1986 and 1991, and the MiG-29M was briefly re-branded as the MiG-35 before being abandoned. Some years later the fourth MiG-29M prototype (Side number 154) was converted to two-seat configuration, becoming the MiG-29MRCA in 2005/06 for the Indian Multi-Role Combat Aircraft competition, and was subsequently re-designated the MiG-29M2. In January 2007 it became the MiG-35 demonstrator. Soon afterwards, the fifth MiG-29M prototype was rebuilt to become the MiG-29KUB (Product 9-47) prototype, while the sixth MiG-29M was modified as the thrust-vectoring MiG-29OVT testbed. The MiG-35 was originally conceived as having a range of advanced systems and capabilities, and the MiG-35 demonstrator was fitted with an NIIR Zhuk-AE AESA radar in December 2008. Two further MiG-35 demonstrators flew in the autumn of 2009, converted from MiG-29K/KUB airframes originally intended for India. The single-seater was known as the Product 9-61 (MiG-35) and the two-seater as the Product 9-67 (MiG-35D). They were delivered to the VKS for flight testing in November 2016. In 2011/2012 two further aircraft were built to meet a Syrian order, which was subsequently canceled. The Syrian version featured a basic Zhuk-ME radar (as used by the MiG-29K/KUB) and was designated the MiG-29M in single-seat form and as the MiG-29M2 in two-seat form. 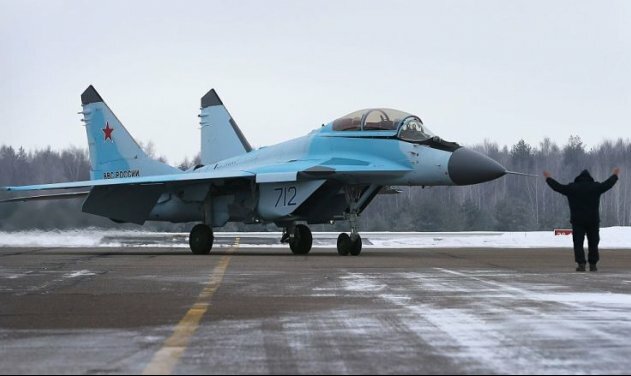 In March 2014 Egypt decided to buy 24 MiG-35s, but changed its order to the “Syrian” MiG-29M/M2 variant before signing a contract for 46 aircraft in April 2015. They were delivered from September 2017. Russia also quietly “dumbed down” the specification of its planned MiG-35, and when the first MiG-35S and MiG-35SD series production prototypes were unveiled by RSK MiG at Lukhovitsky on January 27, 2017, they lacked the once-planned thrust-vectoring and AESA radar. The MiG-35S/SD is now closely comparable to the export MiG-29M/M2 with the exception of a few additional advanced weapon integrations. State trials began in January 2018. The single-seat MiG-35S prototype was rolled out in January 2017. A NATO member, the Polish Air Force remains an enthusiastic MiG-29 operator. 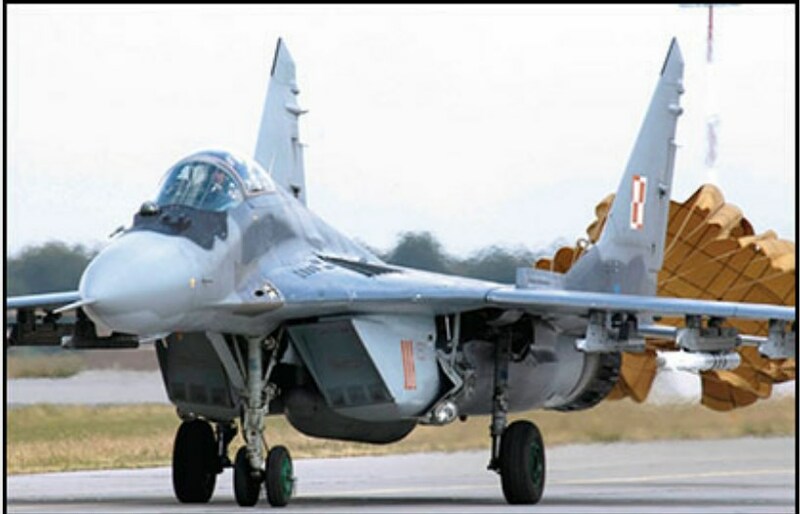 Poland first ordered nine MiG-29As and three MiG-29UBs, the first of which were delivered in 1989. In 1995 Poland decided to purchase 10 surplus MiG-29s (nine MiG-29As and one MiG-29UB) from the Czech Republic. With the withdrawal from service of Luftwaffe MiG-29s, 22 former East German aircraft (18 MiG-29Gs and four MiG-29GTs) were offered to Poland for a symbolic Euro. The offer was accepted and in September 2003 the first aircraft arrived in Poland. In order to operate within NATO, and to extend their service lives, Polish MiGs are being upgraded with a new digital databus with open architecture, a cockpit using imperial units of measurement, a laser inertial platform with embedded GPS and INS, digital video recorder and data transfer system, an up-front control panel, a new UHF/VHF radio, an upgraded IRST sensor and modernized NO19 radar with increased target detection and tracking range.